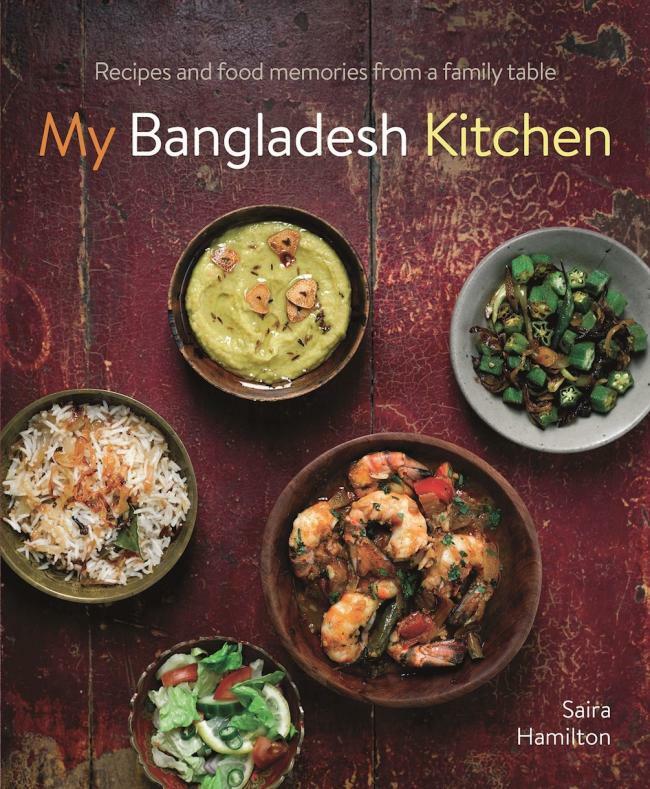 My Bangladesh Kitchen is a collection of recipes and food memories from MasterChef Finalist Saira Hamilton. Although Bangladesh is a country that everyone’s heard of, few people know it or its food. In this comprehensive and evocative cookbook, Saira seeks to show off Bangladesh’s many contrasts through her traditional, family recipes. Prawns are plentiful in Bangladesh and have always been enjoyed there. As with most things, Bangladeshis like to get their money’s worth out of a prawn and they eat every last bit of them. I’ll still never forget the first time my husband watched my petite and delicate mother munching on a massive prawn head whilst we enjoyed a family dinner together. His face was a picture, let me tell you! Personally I prefer the other end of a prawn, and this was a dish I always requested mum to make for any special occasion or celebration. It is quite spicy, but you can reduce the number of green chillies to your taste of course. It is very important to cook the sauce down well before you add the prawns as you don’t want them to overcook and become rubbery. This curry can be made with any size of prawn; tiger prawns work very well. But my particular weakness is for very large king prawns, which is what I look for when I make this dish, and I buy them without the heads attached. Don’t forget to clean and de-vein the prawns before you cook them. Place a large frying pan, skillet or wok onto a medium-high heat. Add the vegetable oil and when it is hot, add the chopped onion. Fry, stirring regularly, for around 10 minutes until the onion is a deep golden-brown colour. Then add the sliced garlic and fry for a further 2 minutes. Now add the ground spices, salt and ginger paste. Add a small amount of water (120ml/4fl oz) and stir everything together. Once the water has mostly evaporated and there is a sheen of oil on top of the pan, you can add the chopped tomatoes, sugar and fresh chillies. Stir everything together really well and allow to come up to a gentle simmer. Then cover the pan and allow the sauce to simmer for around 10 minutes. The next step is to add the prawns, which should be cleaned and ready to cook. (If you are using frozen prawns, make sure they are thoroughly defrosted before you start to cook.) The sauce at this stage should have thickened slightly. Add the prawns to the pan and stir well to coat them in the spiced tomato sauce. Cover the pan again and let them cook for around 5 minutes. If the pan is not simmering well, you may need to increase the heat slightly. After 5 minutes, uncover the pan and turn the prawns. Add in half the chopped fresh coriander and stir well and then cook, uncovered, for a further 2–3 minutes, or as long as it takes until the prawns are completely cooked, firm to the touch and opaque all the way through. The sauce should be quite thick and cling to the prawns. Finally, garnish with the remaining fresh coriander and some extra green chillies if wanted. This curry is delicious with plain steamed rice or with freshly made luchi. My Bangladesh Kitchen by Saira Hamilton will be out in February 2019, priced at £20.